Just as the weather was getting extra chilly, and the dark evenings were making me depressed, we were gifted the most beautiful 70 degree week here! I found myself digging the flip flops back out, and hitting the park as much as possible with the girls. 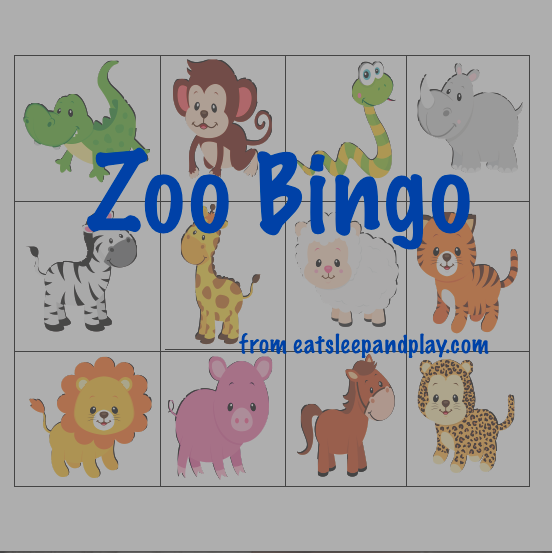 We squeezed in a zoo day at the end of the week knowing that this could be our last visit until spring which is the inspiration for this zoo animal bingo. There was a sweet spot for the zoo with Layla, probably between a year and eighteen months, where she was just perfect to take to outings like this. She patiently sat in the stroller, got out to “oooh” and “ahhh” at the animals, and than sat back down and waited to do it again. These days she’s wants to run the entire zoo (when did someone become too cool for holding my hand? 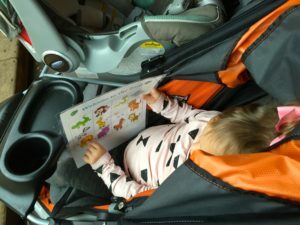 ), and can be completely sidetracked by a puddle, a silly side attraction (damn you face painting and merry-go-round), a leaf, or my personal favorite – another child with a snack that she wants. This visit Layla was definitely testing her boundaries. Olivia on the other hand was just a complete angel, hanging out in her wrap just watching the chaos unfold around her. Let’s be honest, I don’t even think she knew there were animals anywhere around her. Keeping toddlers busy at the zoo! In an effort to keep Layla a little more focused on the animals, I created a “zoo animal bingo.” Obviously the concept of completing a row or column would be lost on her at this age, so we just used the board as a guide for what to see next, and as a way for Layla to identify what she had seen. Older kids (I’d suggest 3+) could use this as a traditional bingo game, and this would be just PERFECT for a field trip with kids K-3. Print your animal bingo here. Not required but I decided to laminate mine so that stickers could easily be moved around on the board, and so that I could save it for later use. 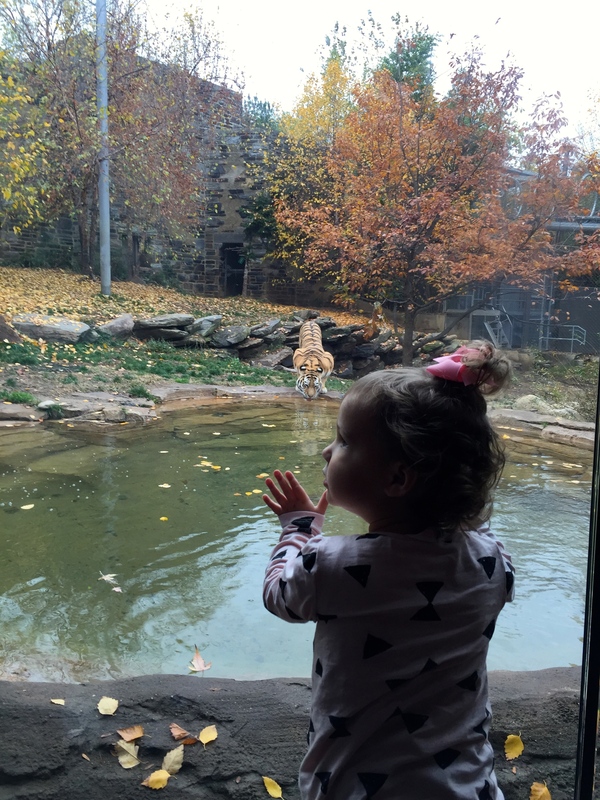 Bring your printable to the zoo and get to finding those animals! For older children working on reading skills you could eliminate the pictures and replace it with the animals names for them to identify. 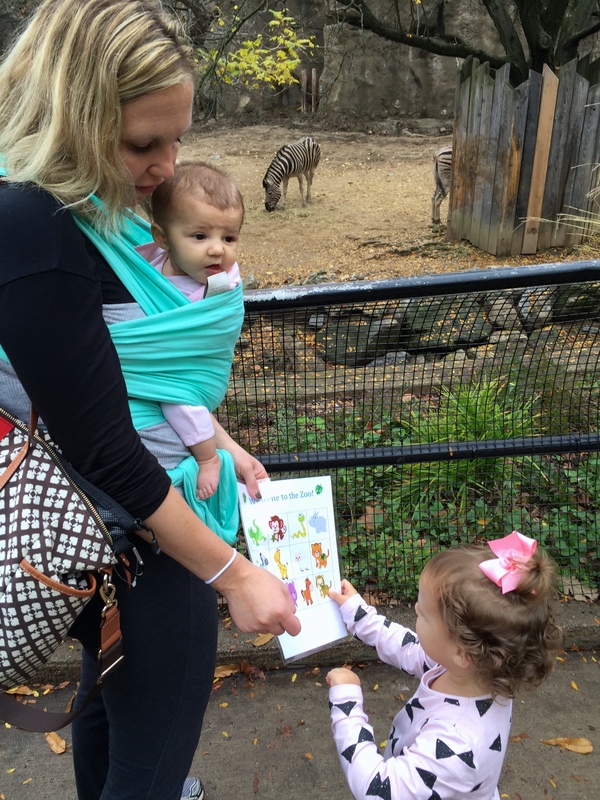 We love visiting zoo’s whenever we travel! Whats the best zoo you’ve been to?